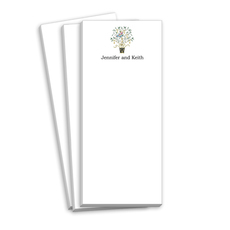 These white notepads come wrapped in cellophane with a coordinating ribbon and are ready for gift giving. Flat-printed on high quality paper in your choice of pad size including large, mini or skinnie (dimensions shown as you place order). Your choice of typestyle for personalization. Includes up to 2 lines of text at the top flat printed in ink color as shown. 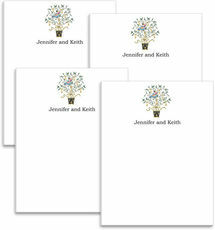 White unprinted envelopes available. Positioning only as shown. Sample shown using typestyle EERR.